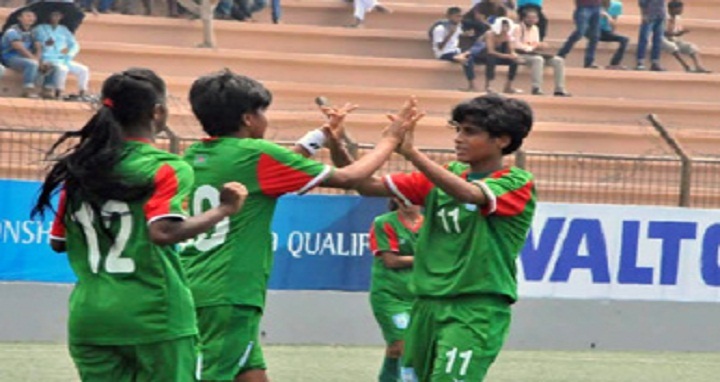 Dhaka, 19 September, Abnews: Bangladesh U-16 women’s football team continued their impressive performance as they blew away Lebanon by 8-0 goals in their second Group F match of AFC U-16 Women’s Championship Qualifiers held at Birshreshtha Shaheed Sepoy Mohammad Mostafa Kamal Stadium in the city’s Kamalapur on Wednesday. In the day’s match, Sajeda, Saraban Tahura and Shamsunnahar Jr. scored a brace apiece while Anai Mogini and substitute Rojina Akhter netted one goal each after Lebanon failed to create any resistance in the one-sided affair. The girls in red and green, who earlier recorded an overwhelming 10-0 victory over Bahrain in their opening group match, scored five goals in the first half before adding three more goals in the second half amid scorching heat. With two successive wins, the girls in red and green are on the top of group with six points, equal with Lebanon but Bangladesh have better goal difference.